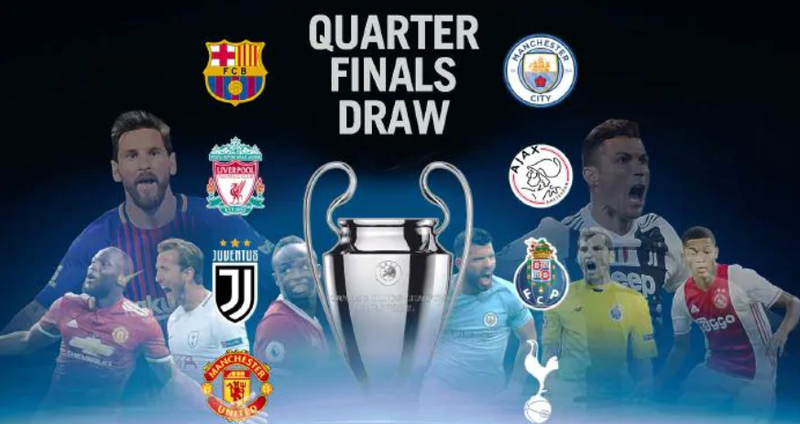 The UEFA Champions League last eight has been decided and now the all-important quarter-final, semi-final and final draw will determine who plays who.The draw for the quarter-finals, semi-finals and final will be held in Nyon, Switzerland. Ajax shocked the football community with 5-1 win over last year champions Real Madrid. Club from Camp Nou is the only Spanish side to get through qrauter finals, Messi has been too good in the round of 16. Juventus’ off-season move to sign Cristiano Ronaldo was intended to end a 23-year wait for a third European title. A finalist last season and now in the quarterfinals again, Liverpool is back at Europe’s top table.The mature way the five-time European champions dealt with Bayern Munich in their 3-1 away win in the last 16 showed how far they have come underJuergen Klopp over the past two years. This season seems like City’s best chance to become European champion since being taken over by its Abu Dhabi owners in 2008. Twenty years after scoring the winning goal for United in a Champions League final, Ole Gunnar Solskjaer is looking to lead the team to the title as manager. Porto is, perhaps, the team everyone else in the draw wants to face. Coached by former player Sergio Conceicao, Porto is looking to go beyond the quarterfinals for the first time since 2004 when Jose Mourinho led the team to its second title. Tottenham is in the quarterfinals for only the second time, despite not buying any players in the past year.